At the end of last school year, my husband and I gave our two boys, ages 11 and 13, a choice: continue to attend regular school, or give homeschool a try. Both very happily chose homeschool. So we started our little homeschool operation in late-August, and we haven't looked back. I worried my older son especially would miss his friends, but they do still see them outside in our apartment compound, and they've had friends sleep over. It's been an interesting, awesome journey, and I would not change it for anything. Our decision to homeschool has now morphed into unschooling, thanks in part to books just like this one. This post, however, is a review of Free to Learn. I promise I will write more about our homeschooling/unschooling journey another day. This was a huge decision that we didn't take lightly, and many factors led up to it. 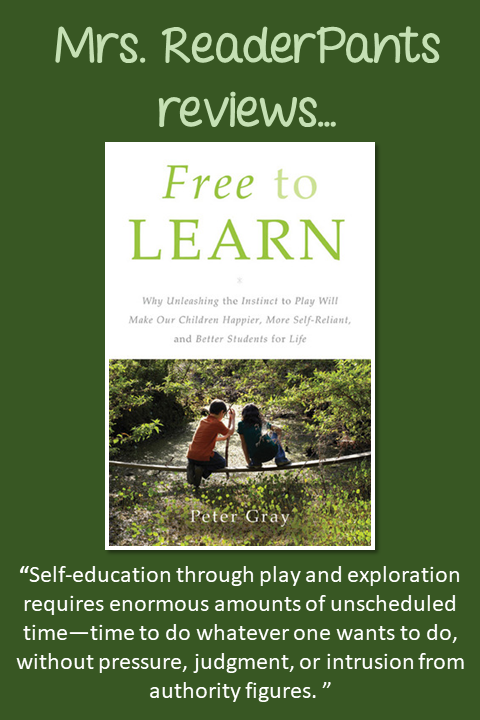 SUMMARY: Peter Gray discusses the history of school, how children learn through play, and the benefits of unschooling. REVIEW: This book was the catalyst for our decision to try unschooling our boys. I had already been listening to unschooling podcasts and done lots of fancy Googling about it, so the thought was already there. But this book was what pushed me over the edge. I'm not going to try to convince the readers of this review to unschool or homeschool. While I've wanted to homeschool my boys since my younger son started school (he's 11 now), I never once saw myself unschooling. Homeschooling might be okay, but unschooling? That's too extreme! Ask me six months ago, and I might have said just that. But I'm starting to see that loving parents make the best decisions they are able to make for their children. What's right for one child or one family is not necessarily what's right for another child or family. Outside abuse, there really is no right or wrong. Free to Learn's conversational tone makes it easy to get-into and stick with. It's not dry, but it is long-winded in parts. I found myself skimming pages in the chapter about aboriginal children's play, as well as some of the studies of how babies and preschoolers learn. It's interesting if you are into children's cognitive development, but for me, it was just a little too much beating me over the head. By that point, I was already convinced that play and unschooling are great for children and teens (and don't forget adults! ), so I didn't need even more convincing by more and more studies. I was already halfway there when I started reading this book, so maybe someone who is more skeptical will benefit from the large number of studies Gray describes. The most interesting section for me was in the early chapters, where Gray discusses the history of school. Think about it: school as we know it today has been around less than 100 years. It hasn't always been this way. Children haven't always been over-tested, over-worked, and over-scheduled. Before we removed them from school, my boys had much more homework, projects, and exams than I ever had in school. They viewed learning as work and something that was forced at school. Their projects, papers, and homework were stressful and pointless. I started to feel irritated that my boys' hard work and stress was less a learning opportunity than it was a marketing opportunity for the school. I work with high school students every day who are stressed out to the point that they skip class to avoid giving a presentation or taking an exam. Some miss lots of school for sick days, often stress-related afflictions like headache or stomachache. Sadly, some soothe their anxiety by cutting themselves or numbing their anxiety with alcohol or drugs or both. All in the name of building their resume for college, where they will continue to build their resume for a job, where they will continue to build their resume for promotions. When do these students experience joy? How do they find balance? Anyway. This is a review of Gray's book, but it is hard not to wrap it all up in my own children and my choices as a parent. Another day, y'all. I do wish Gray had focused a bit more on anxiety in children and teens. I posted a few days ago about my own anxiety and my observations of anxious and stressed teachers and students. I believe anxiety is both epidemic and systemic in today's students and teachers, librarians, counselors, and school administrators. Free to Learn mentions anxiety in students, including an interesting bit about bullying and school violence being a by-product of our competitive school system. But the book is primarily about the importance of play, so I guess I'll have to find another book that addresses anxiety issues in schools. Or maybe I'll just write one myself. THE BOTTOM LINE: A great addition to any library, but I doubt many schools will buy it for the parents' section. It's pro-learning but anti-school and goes very much against the grain. STATUS IN MY LIBRARY: I would love to buy this for our library! It does go against everything school is though, so it could potentially be considered a conflict of interest at my for-profit school. Hey, parents! Come read the book that tells you that our product is harmful for your kids! Yeah, that'll go over well with my administrators. Your comments about the anxiety built into our children as they strive to build a college resume, get ready for the job market, etc. was a discussion I was having with my 30 year old son. He is definitely trying to find balance and find joy instead of the next rung on the ladder. We talked of depression and anxiety. I believe we have built this into our children from a young age. I am older and remember how different it once was. Extra curricular activities were to build a well rounded education NOT become more important than the academics or the family life. The discussion you raise is an important one. I wish our school districts would be considering this as well. I think many of the people I work with suffer from anxiety in some form. I can tell when someone who is normally very nice and sweet bites my or a student's head off for something small. We all need to be kinder and more understanding of another person's struggles that we probably aren't aware of. Instead of getting upset with someone, I am making a conscious effort to see what might be going on underneath all that. Life isn't really that hard, but as a society, we have completely lost our balance.